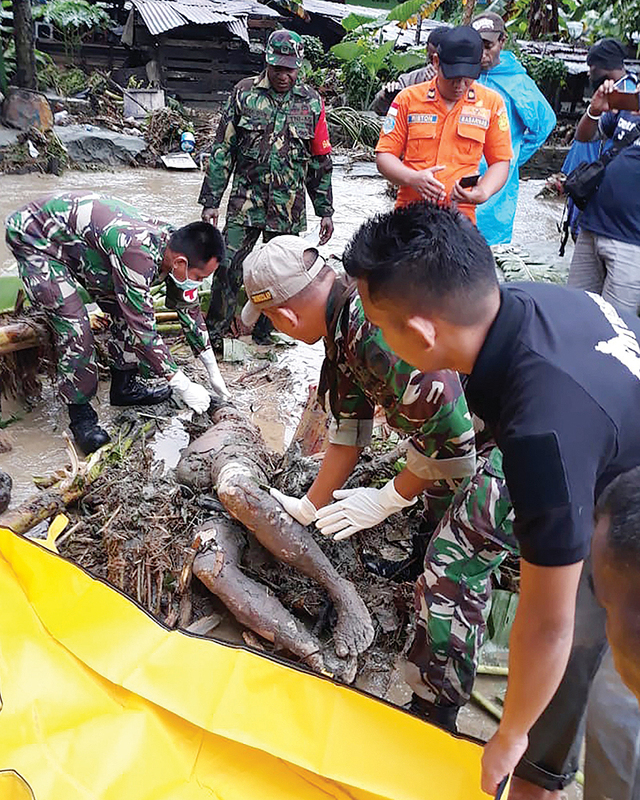 SENTANI: The death toll from flash floods and landslides that tore through Indonesia’s Papua region has topped 100 with dozens more still missing, the disaster agency said yesterday. Nearly 10,000 people have moved to shelters while at least 104 victims are confirmed to have died and 79 are unaccounted for in the aftermath of the disaster, triggered by heavy rain on Saturday. Scores have suffered injuries, including cuts and broken bones, while some 40 unidentified bodies would be buried in a mass grave on Thursday, officials said. Many survivors fear more floods will rip through hard-hit Papua, which shares a border with independent Papua New Guinea on an island just north of Australia. “The increasing number of evacuees has made the shelters very crowded and uncomfortable,” said national disaster agency spokesman Sutopo Purwo Nugroho. As teams loaded mud-caked corpses into body bags, the search for survivors was hampered by mountains of debris including rocks and fallen trees. Hundreds of homes, bridges, schools and other public facilities were destroyed. More than 2,300 personnel have been deployed to search for the missing victims and to clean up debris. Flooding is common in Indonesia, especially during the rainy season which runs from October to April. In January, floods and landslides killed at least 70 people on Sulawesi island, while earlier this month hundreds in West Java province were forced to evacuate when torrential rains triggered severe flooding. Meanwhile, three people were killed-including two Malaysian tourists-and some 182 were injured after an earthquake on Sunday triggered a landslide on the Indonesian tourist island of Lombok, next to Bali.